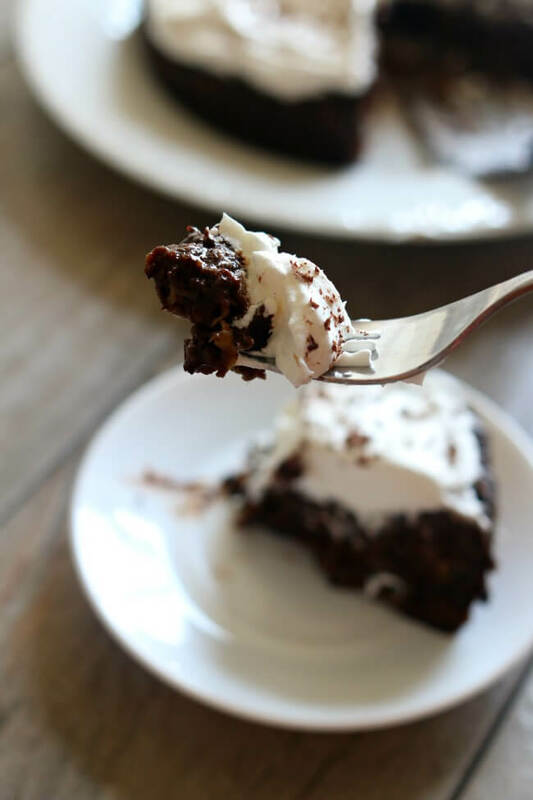 Instant Pot Chocolate Zucchini Cake–an ultra moist, dense and super chocolatey cake made in your electric pressure cooker with your favorite summer vegetable, zucchini. I’m not a fan of cake. I’m more of a brownie and cookie person. I guess it’s just that regular cake isn’t dense enough for me. And many times it’s not moist enough either. 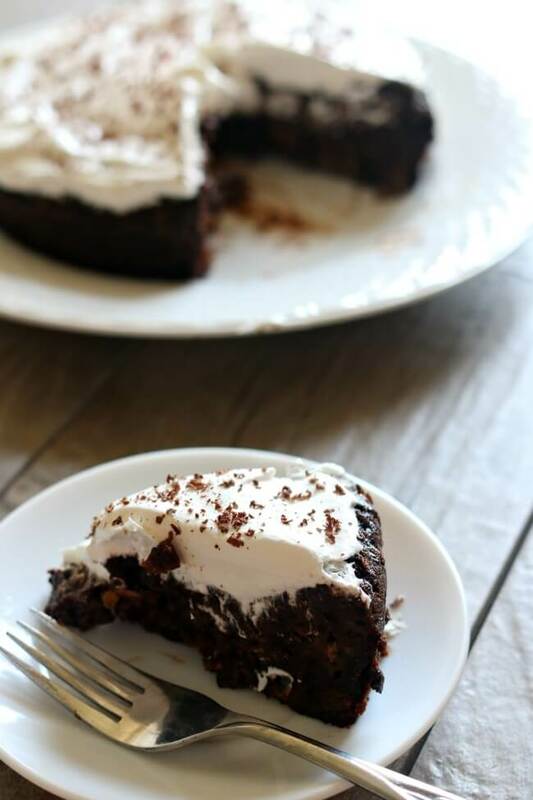 The other day I literally told my husband (after I had a bad cake experience) “I’m never going to eat chocolate cake again.” Well, I guess I’m feeling a little sheepish today because I totally made and ate this Instant Pot Chocolate Zucchini Cake within a week of my rash statement. But I’m telling you this isn’t your normal chocolate cake made from a box. First off, it’s ultra chocolatey. It has a quarter cup of cocoa and a cup of semi sweet chocolate chips in a small cake. Second, the zucchini keeps the cake seriously dense and moist. And finally, by cooking the cake in a moist environment like your Instant Pot it has an almost fudgy consistency. I did order a 7 inch springform pan on Amazon in order to make this recipe. It fits perfectly in the bottom of my 6 quart Instant Pot. You could also use a 7 inch bundt cake pan for this recipe. I’m new to baking in my Instant Pot so if you know of other ways to bake this cake in the Instant Pot let me know! 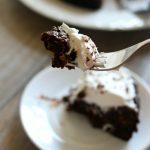 For this Instant Pot Chocolate Zucchini Cake I used my 6 quart Instant Pot Duo 60 7 in 1 for this recipe. I also own the 6 quart Instant Pot IP-LUX60 V3 Programmable Electric Pressure Cooker. They are both great pressure cookers! The first one I mentioned has a yogurt making function but other than that they are fairly similar. The price difference between the two is about $20. 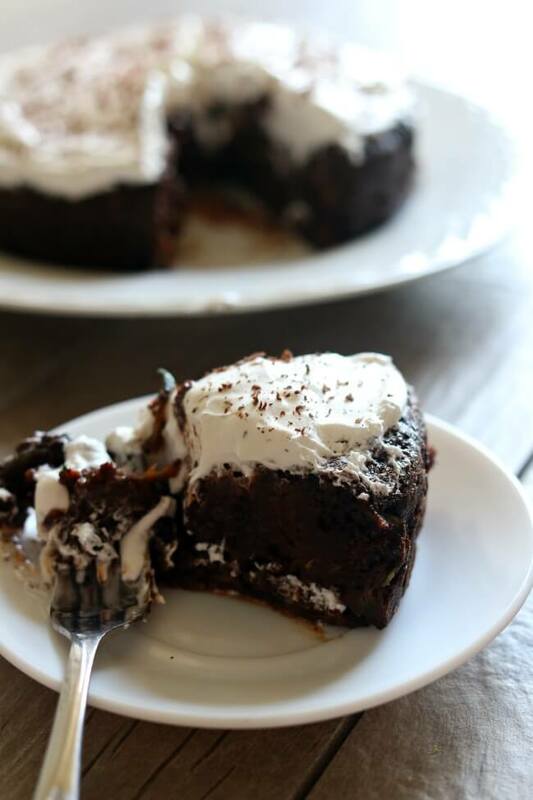 An ultra moist, dense and super chocolatey cake made in your electric pressure cooker with your favorite summer vegetable, zucchini. Place the trivet in the bottom of your Instant Pot with the handles up. Pour one cup of water in the bottom of your Instant Pot. Prepare a 7 inch springform pan by lining the bottom with parchment paper. I like to use a pencil to trace around the bottom of the pan and then cut out the paper with scissors. This ensures a perfect circle of parchment paper that will fit nicely in the bottom of your pan. Spray the sides of the springform pan with non-stick cooking spray. In a bowl mix together the eggs, vanilla, sugar, milk, oil and shredded zucchini. Gently stir in the flour, cocoa, salt, baking soda, baking powder, and mini chocolate chips until no white streaks remain. Pour the batter into the prepared pan. Carefully place the pan on top of the trivet. Cover the Instant Pot and set the timer for 28 minutes on high pressure. Make sure the valve is set to sealing. When the timer beeps unplug the Instant Pot and let the pot sit with the lid on for 10 minutes. Change the valve to venting and let the pressure release. Open the pot and carefully remove the trivet and pan by using the handles on the trivet. I used my oven mitts. Let the pan sit on the counter to cool for 10 minutes. Carefully open the springform pan to release the sides of the pan. At this point you can serve the cake hot with vanilla ice cream or wait until it’s completely cooled and frost it with a layer of whipped cream. It’s up to you! Both are delicious. I haven’t tried making this cake in the slow cooker but I really think it would work well. You could either pour the batter into a greased slow cooker or pour the batter into a cake pan that fits inside your slow cooker. I would cook this in my slow cooker on high for about 2-3 hours, depending on the slow cooker size. 2 hours for a large 6 quart slow cooker and more like 3 hours for a smaller slow cooker. Thanks for stopping by! Do you love crockpot and Instant Pot recipes? Wish you had more good ones that your family would actually eat? Get all my new recipes delivered to your email inbox by signing up below. This cake turned out delicious, very moist and dense, almost like a mix between a brownie and an English pudding. The batter was very loose and liquidy so I was a bit concerned about the cooking time, and I was right to be concerned. All in all I ended up cooking this for almost double the time the recipe indicates. I cooked it first for the designated time and following the instructions for a natural depressurization, and the cake was no where near done. I added another 20 mins and let it pressurized, cook for another 20 mins and depressurize again. Time wise I don’t think this saves you any time over using the oven, but it creates a unique moist texture that I really enjoyed so I would make it agin knowing now I have to cook for significantly longer than the recipe indicated. cake is excellent. however it never rises evenly and my counter is level, any ideas why. thankyou. no I’m sorry I can’t be more help! I made this recipe twice already. I used 7 inch bundt cake form and the cake turned out fantastic. The second time I made it with gluten free flour and, again, it turned out great. Thank you so much for a great recipe! I flowed this recipe exactly, and as others have noted, it wasn’t cooked when finished. The outside edges were dense and fudgy but the majority of the cake wasn’t cooked at all and had the consistency of jello pudding. Is it possible there’s an error in the amount of flour stated? Okay. I am new to my instant pot… But the cake turned out to have a thick, gelatinous consistency that tasted like eggs. I like dense cake, bit this almost tasted raw. Not fudgy or brownie like I had hoped. My first attempt turned out overly moist…seemed undercooked. I will try again. I cooked in an Instant Pot Ultra, springform pan, and weighed out 6 oz of zucchini (which is what you said the whole zucchini would weigh…oops!) 🤪 I think that was too much. I’ll try less zucchini and maybe try a bunt pan to see if it cooks more. The taste was excellent!! 4 stars only because it was way too wet, but I’m trying again. 😁👍 I’ll leave another comment after my second attempt. I have a 6 qt instant pot. Can I make this same recipe in it or do I have to downsize it? And my question is, do I put the trivet inside the steel pot??? Or can I just line the steel pot with parchment and cook it at a lower temp?? You’ll need to have a trivet or something else to lift the pan up off the bottom. The water is essential so that the pot will come to pressure. I used a 6 quart pot for mine too! I am going to try this recipe using my IP 3 qt Lux Mini (which I just love) and the 6×3 push bottom round cheesecake pan. > Since you used a 6 qt do I assume that I have to “half” the recipe for the 3 qt? >Or will this recipe as-is work using the 6×3? >Would the timing still be 28 minutes? >Since it didn’t say would you cover the pan with foil or not (some cakes call for this foil cover)? Just an FYI: There doesn’t seem to be much information or recipes for using the mini’s except for the FB groups. Most information seems to be for the 6 qt which is too big when there is only 2 and leftovers are not a fan in my household. When I contacted IP they told me to “half” recipes from the 6 qt for the 3 qt with the cook times remaining the same. Yes keep the cooking time the same. You can either half the recipe or if your pan fits in there you could just keep the recipe the same amount. You can cover with foil loosely if you want to prevent drippage. Does the zucchini need to be pressed to remove excess moisture? I’ve never baked with it before. Thanks! I did not squeeze the zucchini of it’s moisture but I don’t think it would do any harm if you did! I’m new to using an IP, but your blog sure teaches and inspires me. THANK YOU. My husband does not do chocolate at all, any ideas/suggestions on cakes ‘baked’ in our IP without chocolate. We watch our sugar/salt/fat intake so it makes life hard at times to find a sweet good to eat. Recently bought Swerve, but have yet to try it. I made this and while it turned out beautiful and had a great taste, it also had an odd “gummy” texture. I’m assuming this might have been the zucchini. I did use an extra fine micro-plane to grate the zucchini, so I’m wondering if it might have been too fine and created the unpleasant gummy texture. I was hoping for a texture somewhere between a cake and a brownie. Any suggestions? Hmmm, gummy textures. Weird. I’m not sure what would cause that. It may just be the “steaming” of the cake instead of the baking of it in an oven. I’m not sure what you could use. You’d have to find a little mini pan. You can use a standard 6″ cake pan in your mini and half the recipe (will probably still have some left over batter) or Wilton makes 4″ mini spring forms and you could make two of those by stacking them in the 3qt. I haven’t tried this recipe but I just wanted to warn people about Cocoa Powder. Some brands are dangerous, please check out Consumerlab.com for more info. (no I don’t work for them). Your page and recipes looks wonderful was thinking about buying an Instantpot that’s how I got here. Can use cacao powder instead of cocoa powder? And what about coconut sugar instead of regular sugar? Want to give this to my toddler. Thank you! I’m not totally sure that this would work but I am betting that it would. Give it a try and let me know how it turns out! Do you have to cover the top to keep the steam from pooling on the top like you do with a cheesecake? Hi Carol, you don’t have to but if you want you can gently cover the top with foil! Will it change the cooking time? I’m excited to try this for my daughter’s 19th birthday next week! We’re at about 5,000 ft. – do you know if I need to make any high altitude adjustments to the recipe? It will take longer to cook. Maybe add 5 minutes?? I live at 7500 ft and I didn’t make any adjustments. This was extremely hard to drop down into a 8 quart instapot. At the end of the day it just seems easier to cook it in the oven. After I took it out it did not look like it had cooked enough so I put it into the oven just to be sure. I would not make this in the Insta Pot again. good to know! Thanks Marnie. I have an 8 quart and I notice with recipes like these a cup of water evaporates so quickly that the pin drops before the countdown time is over and there is no water at the bottom of the IP after cooking. Is this safe? Thanks..I would really like to try this recipe. Just add in more water at the beginning! Good to know about the 8 quart. This really came out good, thank you! I used my favorite sweetener (low carb Whey Low,) dark chocolate cocoa, and 1/4C low carb baking mix (from Bob’s Red Mill) with 1/2C AP flour, and I’ll probably reverse the proportions next time. Used Avocado oil, and added a tsp of instant expresso powder. Definitely rich and satisfying for not much calorie damage! If I tried to cook this in a 6 inch pan do you have any suggestions on cook time? More or less time? And do you think it would fit? I have the 8 quart IP. Does anyone have that figured out with a 8″ pan? It doesn’t only LOOK good, it is Good! Made it today. Husband loved it. We just put a pot roast in the Instant Pot. He helped me cut up the potatoes so he can have another piece after dinner! Cannot even taste the zucchini, but it gives a good texture. Looks delicious! Thanks for linking to the cake on Pressure Cooking Today.